SEGALS SOLUTIONS The history, research and results of a study on Rooibos Extract used in the new Advanced Formulation for Thinning Hair. The rooibos tea plant (Aspalathus linearis) grows only in the Cederberg mountains North of CapeTown in South Africa. In recent times, the plant has been recognized for its exceptional antioxidant properties. Rooibos (pronounced "roy boss") contains 37 antioxidant Substances, and is also rich in minerals Such as calcium and potassium. Due to its potential health benefits, rooibos (or "red bush") tea has become popular throughout the world. Not so well known is this plant's promising effects when applied topically to the skin and hair. In a study commissioned by a processor of rooibos for use in cosmetic applications, and carried out by an independent laboratory in France, rooibos was perceived to positively affect the hair and hair growth. In a 90 day trial, the action of a lotion containing a broad spectrum rooibos extract was compared with a placebo lotion without rooibos. The trial participants were healthy men and women experiencing hair loss. At trial end, using a videotrichogramme that measures hair density and hair growth speed, the laboratory noted that a significant increase in the speed of hair growth had occurred in the participants using the rooibos lotion. The participants were next asked to fill in a questionnaire. When the results were tallied, 67 percent rated their hair loss as zero or low, 78 percent saw a low to medium improvement, 45 percent saw a low to medium regrowth of hair, and 63 percent considered their hair had become smoother and more shiny. While this study is not a clinical trial, it nevertheless adds weight to anecdotal evidence that rooibos may help reduce hair loss, increase growth and improve the general texture and appearance of the hair. The secret may lie in its extraordinarily long taproot, which ensures that the plant is extremely drought resistant. Even as a tiny seedling the roots can reach 30cms into the ground (see picture), and up to 2m as a fully-grown bush. Rooibos is also a legume and as such it binds its own nitrogen from the sandy soil, although it still has a very low yield and slow growth. No fertilisation is given to the plants, they grow in the soil as it naturally exists, and periodically the plantations are left fallow, allowing the soil to rest before replanting in later years. Rooibos or red bush tea is rapidly growing in popularity as a result of the growing evidence that it has no known side effects. We now know that this remarkable plant produces a unique beverage that is completely and naturally caffeine free, and therefore undergoes no chemical process to extract caffeine. It also contains on average less than half the tannin of regular tea (Camellia sinensis). Scientific research has also proven that rooibos is rich in antioxidants, including the flavonoids quercetin and luteolin, which have been shown to be both anti-spasmodic and anti-inflammatory. Nobel Prize winning laureate Albert Szent Gyorgy discovered bioflavonoids in the 1930's; quercetin is one of the most pharmacologically active flavonoids. It also has a synergistic relationship with Vitamin C, basically when combined the two together they can enhance the efficacy of each other. Rooibos started its life as a wild plant and it is quite amazing that it was ever discovered. It is one of the few plants that has made the transition from the wild to a commercially cultivated crop; you can still see wild Rooibos bushes growing at the side of the road. Our Rooibos tea plants remain as they have always been, never modified or subjected to hybridization, indeed many of the farms continue to allow indigenous wild plants and flowers to grow amongst the rows of Rooibos, so maintaining a more natural and ecologically sound environment. Little is known about the early history of Rooibos only that it has been used for many centuries by the indigenous Khoisan tribes, primarily, it is believed as a herbal medicine and as a part of their rituals. They used a process thought to have been copied from Malay slaves, but they were the first to harvest the wild plants, chopping them with axes, bruising them with hammers and leaving them to ferment in heaps before drying them in the sun. Aspalathin, unique to rooibos, contributes to its high antioxidant properties. The antioxidant and free radical scavenging activity of rooibos has been compared with green, black and oolong teas. With a DPPH (Î±,Î±-diphenyl-Î²-picrylhydrazyl) radical scavenging method, both fermented and unfermented rooibos extracts were found to be stronger free radical inhibitors then either black or oolong tea but slightly less then green tea on a mass equivalent basis. Other research, however, suggests that rooibos has much high antioxidant activity than green tea. Although the water soluble solids of green, Rooibos, oolong and black teas contain roughly the same amount of flavonoids and polyphenols, the water soluble matter of rooibos tea leaves is approximately half of that of black tea, making the amount of antioxidant activity of rooibos in the same volume of extract much less. The processing conditions of the rooibos tea have shown to have a significant effect on the level of antioxidants present. The polyphenol antioxidants identified in rooibos tea include the monomeric flavonoids aspalathin, nothofagin, quercetin, rutin, isoquercitrin, orientin, isoorientin, luteolin, vitexin, isovitexin, and chrysoeriol. Currently, rooibos is the only known natural source of aspalathin. Nothofagin is similar in structure to aspalathin and has only been identified in one other natural source besides rooibos: the heartwood of the red beech tree (Nothofagus fusca (Hook F.) Oerst, Nothofagaceae), which is native to New Zealand. 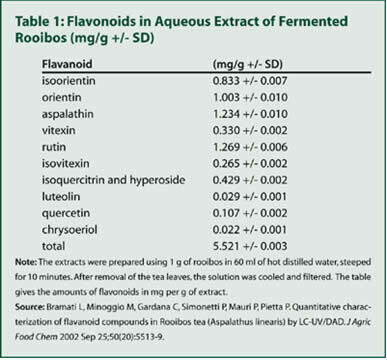 A recent analysis of fermented rooibos measured the levels of all the flavonoids listed above except nothofagin (see Table 1). Of the 10 flavonoids measured, the three that occurred in largest amounts were aspalathin, rutin, and orientin, followed by isoorientin and isoquercitrin. Nothofagin was identified by mass spectrometry but was not quantified because a standard was not available. The amount of nothofagin in fermented and unfermented rooibos was estimated to be about three times less than aspalathin in one study. Aspalathin and nothofagin represent in relatively large amounts in unfermented rooibos tea, but some of the aspalathin and nothofagin oxidizes to other substances during fermentation; thus, fermented rooibos contains less aspalathin and nothofagin than unfermented rooibos. The change in polyphenol composition is the reason the tea changes colour with fermentation. In addition to flavonoid antioxidants, rooibos also contains phenolic acids that have been shown to have antioxidant activity. Like flavonoids, phenolic acids are polyphenol substances that are found in fruits, vegetables, and whole grains. The phenolic acids identified in rooibos, in decreasing order of antioxidant activity as measured in one study with the commonly used 1,1-diphenyl-2-picrylhydrazyl (DPPH) radical scavenging assay, include caffeic acid, protocatechuic acid, syringic acid, ferulic acid, vanillic acid, p-hydroxybenzoic acid, and p-coumaric acid. Using the DPPH assay, caffeic acid was just as active an antioxidant as the most potent flavonoids tested (quercetin, isoquercitrin, and aspalathin). Elizabeth Joubert, Ph.D., specialist researcher at South Africa's ARC Infruitec-Nietvoorbij and a rooibos expert, says that the total polyphenol content of an average 150 to 200 ml can be as much as 60 to 80 mg, depending on factors such as the brewing time and amount of leaves used. For comparison, one study found that brewing black tea leaves for 1 to 3 minutes at a concentration of 1 g leaves per 100 ml water resulted in black tea that contains 128 to 199 mg of polyphenols per 200 ml serving of tea. The types of polyphenols in rooibos are different than those in green and black teas, so the potential health benefits of the teas cannot be compared solely on their total polyphenol content. Rooibos does not contain epigallocatechin gallate (EGCG), which is a polyphenol in green tea that has shown anticarcinogenic and antioxidant capabilities, but many of the polyphenols in rooibos are also strong antioxidants. Two of the flavonoids in rooibos, quercetin and luteolin, are potent antioxidants found in many fruits and vegetables. Studies in vitro (in the test tube) have shown that these antioxidants can cause cancer cells to "commit suicide," referred to as apoptosis. Quercetin decreased primary tumor growth and prevented metastasis in a model of pancreatic cancer. Luteolin and quercetin inhibited proliferation of thyroid and colon cancer cells, respectively, in vitro. Quercetin inhibited cyclooxygenase-2 (COX-2) expression in colon cancer cells, which may help prevent colon cancer. Both luteolin and quercetin can block the formation of lipid peroxides. Although studies like these show quercetin and luteolin are strong antioxidants, researchers haven't yet determined whether enough of either of these two flavonoids are present in rooibos and absorbed by the body to have beneficial effects. As shown in Table 1, recent analysis of fermented rooibos found considerably more quercetin than luteolin, but even quercetin was present in much lower amounts than aspalathin, orientin, and rutin. Based on the data in Table 1, a 150 ml serving of fermented rooibos tea made with 2.5 g of tea leaves has about 0.27 mg of quercetin; for comparison, one study found that C. sinensis contains 1.5 to 3.75 mg of quercetin per 150 ml serving of tea. A previous study found 1.5 mg of quercetin per 150 ml serving of fermented rooibos, but that may be an upper limit. Joubert says that the 1.5 mg estimate is probably high, but emphasizes that these estimates will vary with parameters such as the brewing time and the amount of water and tea leaves used. At any rate, the amount of quercetin per serving of rooibos is a small percentage of the total polyphenol content per serving of rooibos. A unique polyphenol that is one of the most abundant monomeric flavonoids in rooibos tea, aspalathin seems to contribute to the antioxidant capabilities of rooibos, but aspalathin is not as well studied as quercetin and luteolin. Nothofagin is similar in structure to aspalathin and may have similar antioxidant capabilities. Joubert says that chief research technologist Petra Snijman of the Program on Mycotoxins and Experimental Carcinogenesis (PROMEC) at the Medical Research Council of South Africa recently developed a way to isolate pure aspalathin and nothofagin from rooibos. Joubert says, "According to unpublished in vitro studies done at ARC Infruitec-Nietvoorbij, aspalathin compared well with quercetin in terms of antioxidant activity, except in a fat medium where quercetin demonstrated much higher potency than aspalathin. What is important in these comparative studies is the test environment. Relative efficacy will depend on the test system used (the polarity of the medium, the type of free radical that needs to be scavenged, etc.)." Joubert co-authored a study that found aspalathin compared well to other antioxidants with the DPPH radical scavenging assay. The study measured the antioxidant capability of many of the flavonoids and phenolic acids found in rooibos tea and compared them to several reference standards such as alpha-tocopherol (vitamin E). The percent inhibition of the DPPH radical by quercetin, isoquercitrin, aspalathin, rutin, luteolin, and alpha-tocopherol was 98.27, 91.99, 91.74, 91.18, 90.85, and 75.10, respectively (using a 0.25 mole ratio of antioxidant to DPPH). All of the flavonoids tested showed potent hydrogen donating abilities with DPPH except for vitexin, which only had a 7.26 percent inhibition even at a 0.5 mole ratio to DPPH. According to the data in Table 1, a 150 ml serving of fermented rooibos made with 2.5 g of tea leaves has about 3 mg of aspalathin; since the amount of nothofagin was measured to be three times less than aspalathin in one study, a 150 ml serving of fermented rooibos has on the order of 1 mg of nothofagin. A serving of unfermented rooibos has considerably more aspalathin and nothofagin than an equal serving of fermented rooibos because a portion of these flavonoids oxidizes to other substances during fermentation. Orientin and rutin are two of the other most abundant monomeric flavonoids in rooibos, and both have been associated with health benefits. Orientin is a potent free radical scavenger. It reduced by half the number of cancer-associated changes in cells of human blood exposed to radiation. When mice were exposed to radiation, orientin protected against lipid peroxidation in the liver and also reduced damage to the bone marrow and gastrointestinal tract. Rutin, a flavonoid found in buckwheat (Fagopyrum esculentum Moench, Polygonaceae) and some fruits and vegetables, seems to help maintain the strength of capillary walls; oral rutin as well as oral and topical o-(beta-Hydroxylethyl)-rutoside (HR) have been used to treat hemorrhoids, varicose veins, and the lower leg edema associated with venous insufficiency and venous hypertension. According to the data in Table 1, a 150 ml serving of fermented rooibos tea made with 2.5 g of tea leaves has about 2.5 mg of orientin and 3.2 mg of rutin. Although the 10 flavonoids in Table 1 are important because they are known to have antioxidant properties, they only represent a small percentage of the total polyphenol content of a serving of fermented rooibos. A 150 to 200 ml serving of rooibos can have up to 60 to 80 mg of total polyphenols, and Table 1 shows that a 150 ml serving of fermented rooibos made with 2.5 g of leaves has about 14 mg of the 10 flavonoids in the table. Many other polyphenols are present, but they have not all been identified or quantified. To assess the antioxidant capability of rooibos as a whole, researchers compared the antioxidant activity of rooibos tea extracts to that of green and black tea extracts with the DPPH radical scavenging assay as well as the beta-carotene bleaching method. All the teas showed strong antioxidant activity with both methods. Using the DPPH method, the ranking from highest to lowest antioxidant activity was green tea (90.8 percent inhibition), unfermented rooibos (86.6 percent), fermented rooibos (83.4 percent), and black tea (81.7 percent). Green tea was significantly higher than the others (P < 0.05), but the other three teas did not differ from each other significantly with respect to DPPH inhibition. Using the beta-carotene bleaching method, the ranking was green tea, black tea, fermented rooibos, and unfermented rooibos. The relative ranking varies with the type of test because the substance to be tested will have different reactivity to the different oxidizing agents used. These tests only measure the antioxidant capability of substances outside of the body and don't provide data on whether the antioxidants are absorbed by the body and effective after the food is consumed. In this study, all the extracts were diluted to the same amount of soluble solids rather than to the amounts of solids found in the teas. This method allows a comparison of antioxidant capability on a mass equivalent basis, but does not reflect a comparison of the antioxidant strength of equal volume servings. Although the soluble solid content varies with the method of tea preparation, it usually decreases in the order green tea, black tea, unfermented rooibos, fermented rooibos. The percent of soluble solids represented by polyphenols is similar for the four teas and the DPPH antioxidant activity is similar on a mass equivalent basis, so the DPPH antioxidant capability of equal-sized servings will decrease in the order of the soluble solid content. Black and green teas have over twice as much soluble solids as rooibos tea when prepared conventionally, so over two 200 ml servings of rooibos tea would need to be consumed to receive the same antioxidant benefit (as measured by DPPH) as one 200 ml serving of black or green tea (or the rooibos would need to be brewed to twice the standard concentration). This result agrees with the data given previously for 60 to 80 mg polyphenols for a 150 to 200 ml serving of rooibos tea as compared to 128 to 199 mg polyphenols for a 200 ml serving of black tea. The studies referenced above show that rooibos contains antioxidants that have positive effects when tested as isolated substances and that Rooibos as a whole has good antioxidant activity in vitro. In addition to the initial research of Annique Theron other research has shown that rooibos exhibits both anti-viral and anti-inflammatory properties in vitro and is effective against various dermatological diseases in vivo (when taken as a beverage), including acne, atopic dermatitis and in one case protection against photosensitisation17. Rooibos is often used to bathe children with allergic skin conditions at the Allergy and Asthma Clinic at the Red Cross Memorial Hospital in Cape Town. There are also various research studies, which have shown that rooibos tea possesses both anti-mutagenic and antimicrobial activities. There is currently work in progress on the evaluation of compounds from rooibos, as microbial inhibitors. Polysaccharides isolated from rooibos tealeaves have demonstrated antiviral properties in vitro experiments. Studies were initiated by an independent laboratory to study the effect of the use of Rooibos Extract in a hair lotion on a group of healthy persons who were suffering from the problem of hair loss. A 90 day trial was conducted comparing a hair lotion containing Rooibos with a placebo lotion. 5 ml of the aqueous alcoholic solutions were applied daily. Rooibos is produced by a novel dual phase extraction process, which ensures the production of an extract with the widest spectrum of plant actives i.e. polar, semi-polar and non-polar. - The subjective evaluation questionnaire showed that 78%of volunteers were rather satisfied with the product and saw an improvement. Conclusion: These results show that most of the volunteers had a remarkable improvement in both the increase of the speed of hair growth, the decrease in hair loss and an overall improvement in hair condition. The measurements were taken on 10 women, aged between 21 and 44 (average age: 34). All volunteers had chronic hair loss (number of hairs > ten in the combing test). Subjects have to be compliant and do not associate treatment during the study as precisely mentioned in the information sheet. The video microscope is a mobile optic fiber microscope with a variable-magnification lens connected to an image acquisition and data processing system. The lens (x25) faces the zone to be studied but does not touch it. The 16 million color image is displayed on the system monitor. This image is then analyzed with the Dermascan software package "Count Hair" which counts the number of hairs and measures their length. 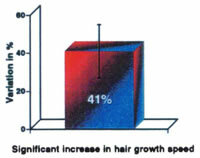 Hair growth is calculated by hair length measurements on Day 0 and Day 2 (on anagen hairs only). The length difference between D0 and D2 is calculated and related in mm per day. A subjective evaluation questionnaire regarding the organoleptic characteristics, tolerance and efficacy of the product is given to the volunteers. The aim of the study was to evidence and quantify the efficacy of the placebo product and "Rooibos Scalp Formula", designed to prevent hair loss. ï‚§ hair growth speed of anagen hairs. Measurements were carried out on 19 healthy volunteers (Volunteer 3 was untraceable on D90), 18 women and 1man, aged between 21 and 55 (average age: 34+/- 2). These volunteers suffered from hair loss. The efficacy of the placebo product and "Rooibos Scalp Formula" was evaluated after 90 days of treatment (5ml per day). No undesirable reaction (irritation or allergy) was observed during test. (variation of â€“17% not statistically significant, with p=0.408). (variation of +38 +/- 16%, with p=0.089). (variation of +41+/- 14%, with p=0.013). The incorporation of Rooibos in a hair lotion prevented the loss of hair and increased the speed of hair growth significantly compared to the placebo. 1. Van der Bank M, Van Wyk B-E, Van der Bank H. Biochemical genetic variation in four wild populations of Aspalathus linearis (rooibos tea). Biochem Syst Ecol 1995;23(3)257-262. 2. Dahlgren R. Revision of the genus Aspalathus II. The species with ericoid and pinoid leaflets. 7. Subgenus Nortieria, with remarks on rooibos tea cultivation. Bot Notiser 1968;121,165-208. 3. Dahlgren R. Aspalathus. In Flora of Southern Africa. National Botanical Institute, Pretoria. 1988;16(3,6)1-430. 5. Red Bush Tea website: <http://www.redbushtea.com>. 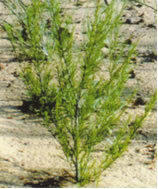 Text discusses the tap root; also see photo of rooibos seedling with tap root on this site. 6. Van Wyk B-E, Van Oudtshoorn B, Gericke N. Medicinal Plants of South Africa. Briza Publications, Pretoria, South Africa. 1998. 304 p. Online condensed version available at <http://www.african-medicines.com>. 7. Van der Bank M, Van der Bank FH, van Wyk B-E. Evolution of sprouting versus seeding in Aspalathus linearis. Plant Syst Evol 1999;219(1,2)27-38. 8. Muofhe ML, Dakora FD. Nitrogen nutrition in nodulated field plants of the shrub tea legume Aspalathus linearis assessed using 15N natural abundance. 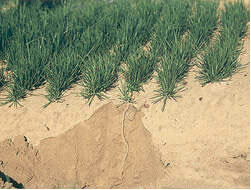 Plant and Soil 1999;209(2)181-6. 9. Van Wyk, B-E. Presentation at the 28th Annual Conference of the South African Association of Botanists at Rhodes University, 2002. Summary at <www.herbsforafrica.co.za/features/recent-herb-research.asp>. 10. WESGRO, Western Cape Investment and Trade Promotion Agency, Cape Town, South Africa, website: <www.wesgro.org.za>. Wesgro Background Report: The Rooibos Industry in the Western Cape. April 2000 (updated April 2001). 11. Renaud, E. Center for New Use Agriculture and Natural Plant Products, Rutgers University, New Jersey. Quality control program for ASNAPP (Agribusiness In Sustainable Natural African Plant Products, website: <www.asnapp.org>). Personal communication. Dec 2002. 12. Pietta PG. Flavonoids as antioxidants. J Nat Prod 2000;63(7):1035-42. 13. Joseph J, Nadeau D, Underwood A. 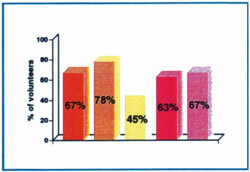 The Color Code: A Revolutionary Eating Plan For Optimal Health, Hyperion, New York, 2002, p. 8-10, 33, 44, 57. 14. Rabe C, Steenkamp JA, Joubert E, Burger JF, Ferreira D. Phenolic metabolites from rooibos tea (Aspalathus linearis). Phytochem 1994;35:1559-65. 15. Koeppen BH, Roux DG. C-glycosylflavonoids. The chemistry of aspalathin. Biochem J 1966;99:604-9. 16. Koeppen BH, Roux DG. C-glycosylflavonoids. The chemistry of orientin and iso-orientin. Biochem J 1965;97:444-8. 17. Koeppen BH, Smit CJB, Roux DG. The flavone C-glycosides and the flavonol O-glycosides of Aspalathus acuminatus (Rooibos tea). Biochem J 1962;83:507-11. 18. Ferreira D, Marais C, Steenkamp JA, Joubert E. Rooibos tea as a likely health food supplement. In Proceeding of Recent Development of Technologies on Fundamental Foods for Health; Korean Society of Food, Science and Technology: Seoul, Korea 1995:73-88. 19. Bramati L, Minoggio M, Gardana C, Simonetti P, Mauri P, Pietta P. Quantitative characterization of flavanoid compounds in Rooibos tea (Aspalathus linearis) by LC-UV/DAD. J Agric Food Chem 2002;50(20):5513-9. 20. Joubert E. HPLC quantification of the dihydrochalcones, aspalathin and nothofagin in rooibos tea (Aspalathus linearis) as affected by processing. Food Chem 1996;55(4):403-11.